Ireland offers a great variety for the hill walker, cyclist, and tourist. There are long and short coastal trails, peaceful mountain routes, and many walks laid out around busy cities to take you past all the must see sites. Hill walking in Ireland can be done all year round given our mild climate – it rarely gets to hot or too cold. So where do you start? How long do you have and what do you like? If you like walking or cycling all the time check out some of the longer route, Ring of Kerry, Kerry Way, Wicklow Way; or if you want to mix it up see the section on travel in Ireland. Just because mileages are short don’t expect to travel fast, the Irish road network is still developing, that and the amount of traffic during the summer months can make short journeys take a while. So relax, this is not a county to hurry around, slow down, feel the atmosphere, and enjoy. 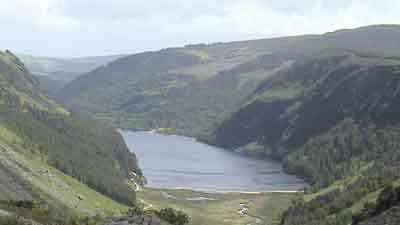 Glendalough lies about one hour south of Dublin. It is the most visited day trip from Dublin City. There is a bus, however it runs only once per day, additional transport include some tour companies. Glendalough is an old Monastic site founded by St Kevin. There are many walks around the two lakes here, the best and most traveled around the upper lake. The area has been preserved, being part of the Wicklow National Park, and it is still possible to enjoy haunting solitude and imagine how far St Kevin must have felt from civilisation. The Ring is Kerry, and the Kerry Way, is one of the most visited areas in Ireland, and rightly so. The Ring of Kerry is a 179km road circuit around the Iveragh Peninsula. Although it can be traveled in a day, by car or tour bus, I would suggest taking longer. Ideally walking parts of it or cycling is the best way to see much of it “up close.” And after a day by the wild south coast, or roaming in the Kerry hills, what better way to end the day than with some food in a traditional Irish Pub with traditional Irish music and great conversation. Dublin, the heart of Ireland and its capital; it is home now to a multi-cultural society of Pubs, Restaurants and People. The new and old live in a hard fought and sometimes uneasy harmony: Christ Church, next door to new non Irish Restaurants; The Spire on O’Connell Street beside the Post Office and its’ history in Irish Rebellions. Dublin is my adopted home, one that has been very good to me. The Wicklow Way was Ireland first long distance way-mark walking trail. Starting in the south Dublin suburb of Rathfarnham and winding for 132km south, it can be a wonderfully desolate route during the week and very busy with day walkers and cyclist during the weekend.